Do you crave the sounds, scents, and sights of a natural setting? Make the time to get away from the bustle of a city for the country flavor of tiny villages in the mountains. Glide in a boat across a glassy lake, visit a historical chapel, and hike to Germany’s highest waterfall, all in one location. Nestled at the base of famous mountains towering as high as 2713 meters, or about 8,900 feet, the Königssee’s crystal clear waters reflect the majesty of snowcapped peaks even in the summertime. This breath-taking landscape is within easy driving distance from Berchtesgaden, Bavaria (southern Germany). dock, savoring the aromas of German cooking and feasting your eyes on the dazzling display of colorful flowers and tourist shop items. After your time away in nature’s care, the atmosphere will entertain and invigorate you while reviewing the day’s pleasures. Purchase tickets at the village’s boat docks for a round trip to Salet at the opposite end of the lake. This encompasses an intermediate stop, both coming and going, at St. Bartholomä, where an exquisite chapel, first constructed in 1134, then later redone in baroque style, rises into the air with gleaming white walls and red-tiled onion domed towers and domed roof. The small peninsula enclave holds a restaurant, an inn, once used by Bavarian kings for a hunting lodge, and manicured lawns. 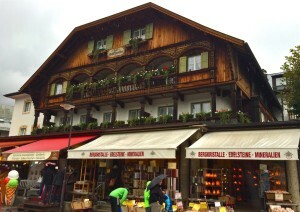 While crossing the waters, your tour guide will point out famous mountains, such as the Jenner Mountain, which has a cable car to the summit and a ski resort, and the Kehlsteinhaus, known to American’s as the Eagle’s Nest, at over 6,000 feet. Hitler used the Eagle’s Nest, a diplomatic house, as his personal getaway. 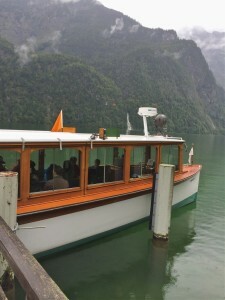 The Königssee could be called a finger lake due to its length and width. The narrow body of water stretches over a kilometer wide at one point and extends almost 8 kilometers in length. The deepest point is 660 feet. Germany has designated this area as part of the National Park, Berchtesgaden, and declares the lake to be the cleanest in Germany. 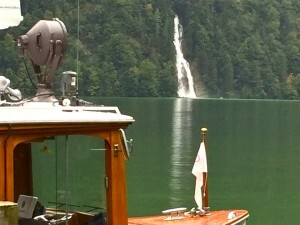 Only electric motors may power the glass-windowed tour boats plying the serene blue waters. In Salet, at lake’s end, another restaurant and lodge await you. 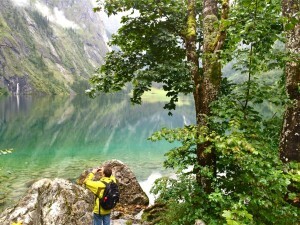 A short hike leads to the Obersee (or Upper Lake), a smaller, quieter version of the Königssee. Seize the opportunity to explore further on a medium difficulty trail to the Röthbachfall, which is Germany’s highest waterfall, plunging over 1200 feet from its summit. 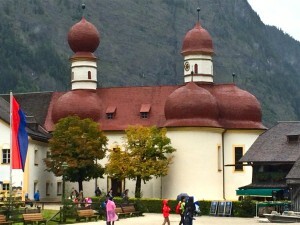 A few of my pictures of the treasures at the Königssee emphasize the incredible scenery and idyllic setting available to enjoy when you visit. Add this stop to your Germany itinerary. Here’s a website with more information: https://en.wikipedia.org/wiki/K%C3%B6nigssee.